Even though waterless cookware has been around for a long time, it is now being looked at again. I remember my parents buying a complete set of waterless cookware when I was a kid. Waterless cookware is coming into it’s own again and getting increasingly popular. This article will explain the good points of cooking waterless and any negative sides to this type of cooking. With more and more people looking for healthy alternatives, waterless cooking can be a good option. If you are interested in this method of cooking, I will try to enlighten you to the pros and cons of cooking without any water. Just what it says it is, you cook your food without any added water or oil and let your food supply the moisture to cook the food. Basically, the main difference is the lid. Realistically the lid should fit nice and tight. Many sets have adjustable steam valves so you can control how much steam is released while cooking is being done. 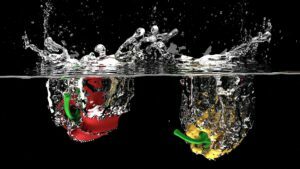 There has been much discussion about waterless cooking. 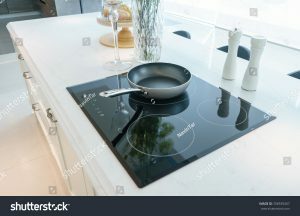 Is it necessary to use pans designed for that purpose or can you use regular stainless steel pans? Some discussion says you can use regular stainless steel pans. I don’t recommend using just any pans.. Using the right pans will ensure that the heat is distributed evenly and the food gets cooked in it’s own juices, which keeps the vitamins and nutrients in your finished dish. Plus, your food won’t stick which is a possibilty with regular cookware being used for waterless cooking. Waterless cookware is made with high quality stainless steel, rather than aluminium. Aluminium cookware leaks into the cookware which is not healthy, so stick to stainless. High quality stainless steel is the best product to use for waterless cooking. Waterless cookware is very easy to clean. Not much cleaning involved. Food cooks quicker and at a lower temperature and in it’s own natural juices. Basically, all food contains water and juices to cook the food, rather than adding plain water or oil, giving the finished dish more flavor and saving a lot of the nutrients. In most waterless cookware the lid is made to fit perfectly and most brand names have valves on their lids. This is to help tell the cook when the cooking process is done or near done. This allows the food to finish cooking and still save energy. The only disadvantage that I found to waterless cookware is the cost. Some waterless cookware sets could start at $2,000. But, if you are concerned about eating healthy, cook using less time and energy, waterless cookware might be just the ticket for you. Inside layers could be aluminium, aluminum alloy, copper and even cast iron in the center for the best heat distribution. Lids have a valve to let you know when to turn heat to low. The more expensive cookware have a valve control which is regulated by a whistle. Uses surgical stainless steel in it’s construction. Without being too technical, the best ratio is chromuim 18% to nickel 10% ensures that your pans cook better, keep their shine better, and are more corrosion resistant. Good waterless cookware can be used on all types of stovetops. Electric, gas ceramic and induction cooktops. Another advantage to using waterless cookware is the ability to cook stacking the pans on top of each other, using only one burner, which is a big saving of energy. I’m not sure if I would use that, but it is an advantage for some. Here are some waterless cookware sets I found to give you an idea what’s available. All the cookware are constructed of extra heavy stainless steel and will last a lifetime. The valves which control the steam make waterless cooking easy. 7 ply construction distributes the heat evenly and quickly, making it possible to stack cook. The phenolic handles are resistant to hot, cold and even detergent. This set has a limited lifetime warranty. Well-cladded 3 ply construction w/110 gauge thickness. Big savings on time and energy. Excellent review for this cookware. Better to have a few great pans to cook with than a lot of not so great cookware. Jute grocery bag and 360 recipe cards. Constructed of extra-heavy stainless steel and guaranteed to last a lifetime. Steam control valves are a snap to making waterless cooking easy. The 7-ply design helps spread the heat evenly and quickly. You can even stack cook with this cookware. The handles are made from a plastic called phenolic which are resistant to heat, cold, and dish detergent. Works well cooking on low or medium heat. Dishwasher and oven safe. Can be used on gas, electric, ceramic, halogen or induction cooktops. Limited lifetime warranty. Made in the U.S.A.
Vapor cooking or waterless cooking with an excellent set of cookware. Cladded 3-ply construction with 110 gauge thickness. Cooks without the need for oil or water. Includes slow cooker base included. It converts the 4 quart stock pot and the 2.3 casserole into a slow-cooker. Enough pieces to prepare a dinner party for a large group of people. this set has a bonded aluminum , which provides excellent even heating. Plus,this cookware is very versatile. You can use it on your stove-top, in the oven or broiler and is safe to put in the dishwasher. Long, easy to lift handles give you a safe grip, even with a full pan of food. The handles stay cool and are double-riveted by hand. Measuring is made very easy by fill lines on the pots and all the lids have straining vents so you don’t need a colander to drain the liquid from the pans. Good to use on gas, electric, electric ring, halogen, glass ceramic or even induction stove top. Safe to use any type of utensil with this brand. Calaphon is a well know brand and is very reputable and well liked. I hope this article has helped you understand the different cookware available for waterless cooking and will help you in your decision making and will help it will you find the right cookware set for your needs. So what’s important to look for in the best inexpensive cookware. First of all everything, everything is relative when it comes to price. What might be expensive to some people might not be for others. What are your needs? So I’m going to base my article on what is available in the lowest price range possible. When choosing cookware a lot depends on your skill level and your desires to cook. Some people love to cook and spend a lot of time in the kitchen. Other people just cook out of necessity. So, naturally someone who likes to cook would appreciate better cookware. So first you have to decide what category you fall into. There are many options for you to choose from. Choosing the right cookware for your needs takes some consideration. 1. What are your needs in the kitchen? 2. How large is your family? 3. Do you cook often? 4. Do you entertain often? 5. How much storage space do you have? These are some things to consider when deciding to purchase new cookware. Sometimes the cheapest is not the smartest way to go. It could end up costing more in the long run. 1 medium size skillet or fry pan. Do you like cast-iron cookware? All the cookware should be versatile enough to go from the stove top to the oven and another plus would be that it is induction ready. You never know, an induction stove top or stove may be in your future. Also, it might be more cost effective to buy individual pieces as opposed to a complete set. Also, be aware of weight, what does not seem heavy now in a few years could feel very heavy, especially when your pan is filled with food. I will start out at the lowest price range possible. This is the first set I will show you. The T-fal $54.82 This is non-stick inside and out. Dish-washer and oven safe to 350 degrees. 10 pieces in Charcoal, this cookware is very reasonable with plenty of pieces to ensure you can cook a complete meal, from soup to nuts. Easy, non-stick 10 pieces set includes all the pieces you need to plan and cook everyday delicious meals. This set is very durable, dishwasher safe for ease in clean-up. High quality, non-stick interior helps with healthy lifestyle by cooking without oils.and fats. The heavy gauge contributes to efficient cooking, with even heat. Ceramic interior is PTFF-PFOA free and also cadmium-free. Limited lifetime warranty, and safe for all cooking methods, except induction. Can be used on stove top up to 570 degrees and 350 degrees in the oven. Perfect for browning meat and poultry creating crispy and delicious cooked foods. Distributes heat evenly with no hot spots or problems with sticking. It even has a one-egg wonder. This set is considered very durable and will last a long time. It has a life-time warranty, easy to clean and is truly non-stick. Oven-safe to 350 degrees, and cookie sheet to 450 degrees. It’s unusual to include a griddle in a set, but it’s very good for pancakes. Both the skillets and griddle have the unique feature of the Smart Glide non-stick dimpled surface. Double riveted handles have a good grip and shatter resistant glass lids seal in moisture and heat. All in all, a good quality set for the price. With this cookware you will be able to create exciting and delicious meals with very little effort. Dinner time is never boring with the help of Rachael Ray cookware. Create all of Rachael’s inspiring recipes with the help of this versatile cookware. Rachael Ray Hard-Anodized cookware is the perfect low priced set that anyone can afford and has great style, and this 10-pieces set certainly fits the bill. The cookware is coated with a sturdy nonstick finish both inside and out for no-hassle food release and easy clean up. The tempered glass lids let you keep an eye on your food while it cooks, helps keep heat and moisture sealed in. Grippy handles feature bright orange padding for a comfortable feel. This cookware is oven safe to 350 degrees Fahrenheit and dishwasher safe for convenient, fast and simple cleanup. Also, has a lifetime warranty. This cookware set has a very hard exterior, harder than stainless steel, creating good durability and outstanding performance. The pans have excellent heat distribution, heat up quickly and evenly, helping to eliminate hot spots. Ouantonium non-stick surface has been strengthened with titanium, helping to release food easily and to have easy cleanup. Good for all cooking methods and safe to use with metal utensils. Riveted handles stay cool to the touch with pouring rims on the pans to help prevent spills. Tempered glass lids allow you to observe your food while it is cooking. Those are a few of the cookware that I featured in this post. I hope it was helpful and took some of the mystery out of cookware on the less expensive side. Click on any image to check out this cookware. Cast-iron cookware has taken a back seat to all the newest and supposedly greatest cookware that has become available today. But, don’t sell cast-iron products short. It is still one of the best products available and better than ever. Plus the price is right. Much more affordable than many of the so-called high-end cookware. You can get started with a basic starter set that won’t set you back megabucks. Cast-iron cookware is very versatile and can go from the stovetop to the oven. You can braise with it, cook eggs and bacon, even do stews and soups. Heavy duty skillets are a timeless addition for every kitchen. Also, great if you are into camping, perfect for campfires. Today, many cast-iron cookware come already seasoned from the factory, making them easy to clean, keeping them non-stick and adds a lot of flavor to your recipes. Cast-iron cookware is very versatile, in that it can be used on top of the stove, in the oven, under a broiler or even over a campfire. It can withstand heat up to 500 degrees. Most can be used with induction cooktops. Just be careful of scratching the stove’s surface. Cooking in cast-iron will increase the iron content in your food, which is a good thing, because we all need iron as a mineral supplement. But, you do have to be careful of cooking acidic foods, like tomatoes and spaghetti sauce. The food can take on a metallic taste which is not appealing. So be mindful of that. Even if you are a beginner in the kitchen everyone needs a cast-iron skillet or pan. They are considered a work horse in the kitchen, I know I go for my cast-iron skillet usually before any other pan. If I had to downsize for a while and could only have a couple of pans, you know one would be cast-iron. Probably the skillet, it so versatile, you can cook a whole meal in that one pan, also stews or just plain eggs and bacon or eggs and steak. Some folks claim that cast-iron is delicate, that it can crack, rust or chip. Well, I never found that to be the case. Maybe a little rust from lack of use. Just clean it and season it and you’re all set. If your pans are seasoned properly, you shouldn’t have any problem. Now, what kind of cast-iron do you want? Do you want traditional or enameled pans? One advantage to purchasing cast-iron is that the pan is made in one piece. No worries about separation of the different parts where they are joined together. Cast-iron is great at conducting heat and comes in many sizes to match up with all your cooking needs. But, be aware, it requires a little more maintenance than some other types of cookware. Always purchase the smallest size needed as larger sizes can be quite heavy, especially when filled with food. 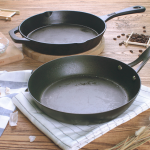 When purchasing cast-iron be aware that traditional uncoated pans must be properly seasoned. But, if you prefer to purchase pans already seasoned, prepare to pay more. After a pan is seasoned, do not wash it with soap and water, or put in the dishwasher. Scrape the residue out of the pan, wipe with a paper towel, add a little oil to coat and store where there is not any moisture. Choose enameled cast-iron if you want a little less work in the maintenance department. 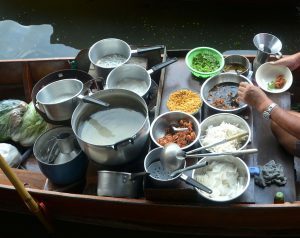 Seasoning is not required and the pans can be cleaned and washed in the traditional way, with soap and water. Also, can be used to cook all foods, even acidic foods, like tomatoes and spaghetti sauce. The downside of the enamel cast-iron is that the enamel can chip after time. I had an enamel Dutch oven that was great and never had any problems with it. Gave it to my daughter-in-law when I downsized and she still uses it and loves it. The enameled cast-iron is more expensive, so I suppose it depends on how much you are in the kitchen and how much you enjoy cooking, how much you will use it. Like anything else, good brands cost more but in most cases will serve you better in the long run. What pans do you need? If your cooking includes a lot of grilling, saute` or frying, your best bet is a skillet. It’s very muli-purpose. But if your cooking includes soups, stews, roasts, like pot roast, spaghetti sauce, you will definitely need the large size, like a Dutch oven. If you are watching your pennies, you might want to check out second-hand cast-iron cooking pans. You sometimes can find them at estate sales, garage sales and flea markets. They might not look so good but with a little TLC, you can bring them back to life. So don’t be afraid of cast-iron cookware, it can be a very versatile addition to your cooking products. I have used cast-iron for many years and have done plenty of cooking for my large family from spaghetti sauces to lasagnas, plus plenty of casseroles in the oven and I always knew everything would come out good if it was done in a cast-iron pan. Plus, these pans will last forever, just give them the proper care. So hopefully, I have given you some useful information on cast-iron cookware and the benefits of cooking with all the different varieties of this great cookware. Have you been looking for the best method of seasoning your cast-iron pans? Here is the newest method of seasoning cast iron pans that I recently heard about. There is more time involved, but very little actual labor. I always seasoned my cast iron the way my Mother taught me. The way she learned from her Mother, so naturally a newer better method was due. Place the cast-iron pan on the medium heat burner. Wipe the pan with vegetable oil. Repeat this process until the cast iron turns shiny. When the pan start to look like it needs to be seasoned again, just repeat the process. But, then I heard about this method, which seemed like a longer lasting seasoning. I decided it was time to update the seasoning process. Click here to give it a try. This newer method calls for multiple coats of flaxseed oil and placing the pan in the oven for 1 hour at a time. The flaxseed oil bonds so well, compared to the seasoning with vegetable oil. It creates a bond-like finish, similar to a veneer. Much different from the vegetable oil seasoned pan, which had rust spots and places where the seasoning was completely gone after a run through the dishwasher. So the difference is in the flaxseed oil, so, let’s get started. Warm an unseasoned pan in 200 degree the oiled pan upside down in a cold oven.for 15 minutes. Take the pan out of the oven and put approximately 1 tablespoon of the flaxseed oil in pan using paper towels and tongs to spread the oil around all the surface of the pan. Using clean paper towels, completely wipe all the excess oil from the pan. Place oiled pan upside down in a cold oven. Then heat oven to highest temperature. After oven reaches it’s highest baking temperature, heat the pan for 1 hour.. Then turn oven off and let pan cool in the oven for 2 hours. Repeat this procedure for 5 more times, until a dark, matte finish is achieved. This method works so well due to the use of the flaxseed oil, it has 6 times the amount of omega-3 fatty acids than vegetable oil has. Over extended exposure to high heat helps the fatty acids to form a matrix finish. This method works very well, but be prepared to devote 18 hours baking the 6 coats of flaxseed oil into your pan or pans. So, if your have more than 1 cast iron pan, you would be wise to do them all at once. If you have a cast-iron wok, that will well as well. Vegetable oils and shortening leave cast iron soft. 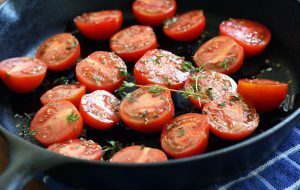 That makes the cast iron pans susceptible to wear and tear, but flax seed oil, which is equal to food grade linseed oil, the oil used by painters to create a protective layer on their wood, is what makes smooth surfaces on cast iron. Make sure you use flaxseed oil, it’s the oil that works. You don’t want to put that much time into this process to not have it turn out right. Check it out. The requirements for flaxseed oil are very specific, no flavors, additives or any other oils to prevent oxidation (you need oxidation in this method to work. It must be 100% flaxseed oil that needs refrigeration. If it doesn’t say refrigerate, you bought the wrong product. In Canter”s article she doesn’t specify if the oil she used should be filtered or unfiltered. After checking around I heard that either is fine. The brand that Canter used is unfiltered, so that’s what I used. Figure around $17.00 for a 16 ounce bottle. Seasoned cast iron pans can last at least 1 lifetime and probably more, so they can be a very good investment. Then you can pass them down to your children and grandchildren.